Trainings are rarely as fancy as you might think based on what you see on the competition grounds, where only the elegance and perfected moves are shown. Behind the scenes, accidents do happen just like any other sports, and gymnasts have to go through all the bruise and cuts just for a mere one or two-minute show. However, not to worry – unlike what you’ve seen in documentaries, our fun-loving coaches make training sessions enjoyable, and safety is given top priority in this sport. And no, we are not a performing art, but a SPORT. It’s definitely a change from the traditional idea of sports where people sweat it out against opponents and each competition seems like a battlefield. However this is the beauty of gymnastics, as competitions are platforms to showcase your own handcrafted routines as compared to intense matches or rallies you see in other sports. So if you are someone who likes to perform and take on new challenges, gymnastics is the CCA for you! 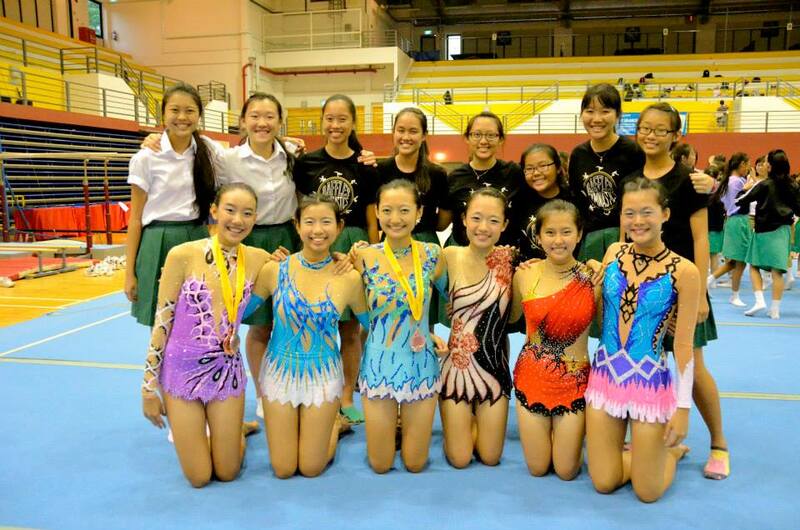 Raffles Gymnastics offers 2 types of gymnastics – rhythmic gymnastics and trampoline. Rhythmic gymnastics is essentially a mixture of dance, apparatus manipulation with a touch of ballet within. There are 5 apparatuses in total which you can choose from to choreograph a 1:30 routine – rope, hoop, ball, clubs and ribbon. Each choreography includes a range of items, from pirouettes and split jumps to even essential dance moves in between. It may at first seem impossible to reach the kind of precision experienced gymnasts have, doing a series of turns and flips while at the same time your apparatus is flung into the air, and you would have to reach exactly at the spot it will land on a few seconds later. However with practice (and a tiny bit of luck sometimes) comes the satisfaction of mastering something extraordinary! Through trampolining, you get to experience the sensation of flying – without a harness! Sounds petrifying? It will be. However, with the guidance of our experienced and caring coach, you will be able to slowly overcome your fears and be comfortable with jumping double your height in no time! Trampoline gymnastics may seem intimidating, having to perform flips and twists so high up in the air. While it is a sport that challenges you both physically and mentally, it’s also one that never fails to thrill. You’re in for an elevated CCA experience – after all, it’s not every day that you get to jump on a trampoline! Many of you probably have the misconception that it’s too late to pick up gymnastics in JC, but just like you, many of our existing members were also new to the sport and are now preparing to compete next year (2015). With 2 experienced coaches dedicated to helping you develop your potential, all you need is passion and willingness to try! Just like any other CCA, practice makes perfect and our training times are Mondays and Fridays, 6pm – 9pm. If you wish to have a feel of gymnastics but are afraid to over-commit yourself, there’s also the option of joining recreational gymnastics where everything else is pretty much the same but trainings are reduced to 1 day a week. 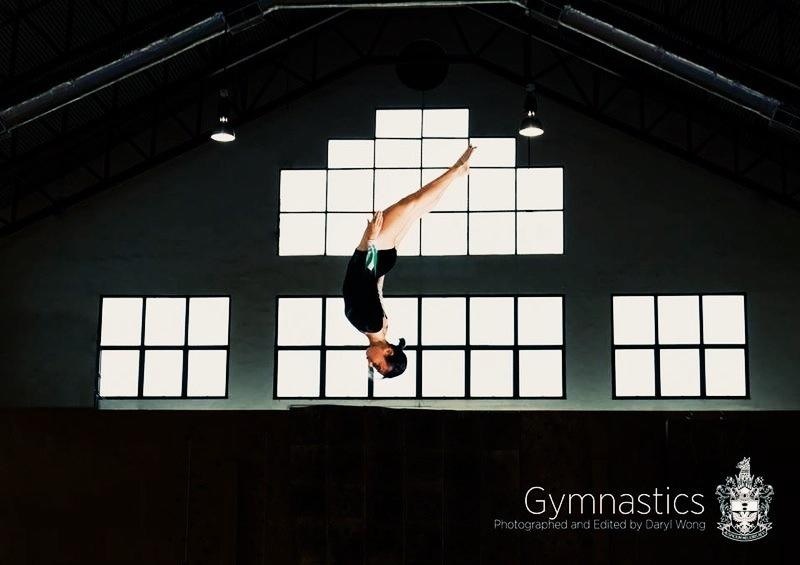 Gymnastics may seem like an individualistic sport, but in reality, it requires team effort and the support of your teammates, from spotting for you when you attempt dangerous flips, to assisting you in perfecting and nailing your moves. It is a sport where everyone cares for each other, and has fun together even though training timings fall late in the evening. Through numerous trainings and CCA outings you won’t just find a team here – you’ll find a family. Absolutely no prior experience is required, so what are you waiting for? Don’t be split on your decision and join us today for a flipping good time!